Here's the revised set review for the V-19. Wings fold down and landing gear folds up to go from landing mode to flying mode! V-19 Torrent has a 21�" (55cm) wingspan! Measures 9" (23cm) long and 9�" (24cm) high! This set has lots of dark red piece which great for any of you that are going to ripe it apart for pieces. The overall engineering Lego did on this thing is awesome with landing gear that deploys as you fold up the wings and visa versa Swoosh ability? It's pretty good. The ship is a little hard to hold since in flight there's a thin wing where you would usually hold a ship. One of the nice things that makes this set more playable are flick missiles set includes 4 missiles however only has slots to fire 2. For all you minifigure collectors, you'll be happy to have a new minifigure. As far availability I didn't have problems getting it, several on shelves. The numbers are dropping from the first stock but I'm sure there's more coming. Overall the engineering on this thing makes the set for me. Finally someone works at Lego that can build a function able set. My show room collection wouldn't be complete with out it. Sadly only one clone and he has none of the new accessories. Also there is nowhere to put his gun on the ship. One major issue was holes in the cockpit. Not so much an issue but just annoying was the landing gear "foot" was basically one large black molded piece. Overall, it could have had some more bells and whistles. Did you have trouble with the landing gear. Mine is drunk. It can't stand upright on it's landing gear. It just falls over. No/yes, pay close attention to the smaller black gears that slide in towards the end. If these are off by even one tooth it probably isn't tilting far enough forward, therefore, like a drunken donkey, it falls on its boots! Make sure the section with the larger gears is pushed all the way forward. Then as your holding it tightly in place you can slide the back smaller gears into a tighter slot that should keep it standing. I had the same "problem" but I caught it. As I was building it, I thought to myself, �This is too loose. I'm going to see if this goes tighter." It did. Hopefully it works for you too. Great revised set review Rook! I got this set recently and had the same issue with my landing gear. My final solution was to advance the gear one turn before sliding the smaller gears into place. This required holding the ship against my body to make sure the wings were all the way up as I slid the gears into place with my other free hand. The final stance of the ship is that it sits slightly nose down. 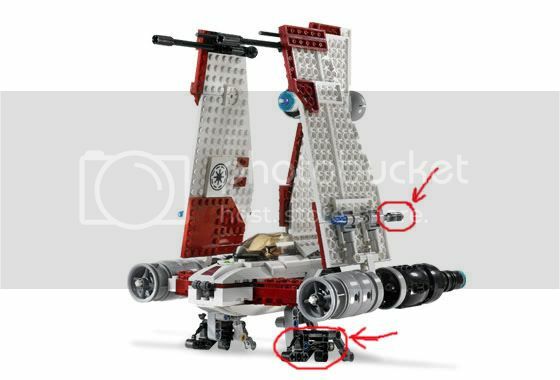 Looking at the official Lego pics, it looks like they had the same final assembly stance, but rotated the pictures to make it look more level. Check out the shadows in the pics to see if you find the same thing for yourself. Or maybe I'm just seeing things. The rotating wing mechanism is very similar to the 7659 Imperial Landing Craft, but stepped up one more notch with the addition of the center wing as the actuator instead of a hand turned tooth gear. This set is a great mix of Technic parts with standard bricks and plates. I really like this trend that Lego has been using in their recent models. Great set (It Rocks! ) and I would recommend it to someone with some mild building skills. It's definitely not for the novice builder. Much better review Rook. I have to find the money some how to grab two of these. I mainly just want the pilots for the RGS. Yep, on the right engine the angle increases as you move from left to right following the bottom line of the engine and the line of the shadow. You can also see it in the feet but they are smaller so it's much harder to see. I've just picked up this set, and managed to build it successfully without the wonky-landing problem. I'm enjoying the sturdiness of the thing - compared to say, the ARC 170, the V-19 is far more able to stand up to swooshing and anything greater than a slight knock. The technic construction is pretty clever, but doesn't take up too long, unlike the motorized AT-AT! Decent set, though badly overpriced at �49.99 RRP in the UK. Of the three Clone Wars sets I've picked up, this is my favorite. It's much more swooshable than the RGS. And I love the entire wing/landing gear mechanism. I'm not much of a minifig collector, but I have to say the Clone Pilot is excellent. I wouldn't mind having a few extras; perhaps some BPs will fill that void. I'd say that the V-19 is a must buy for any PT or CW fan. Oh, and I had no problems with the landing gear. I even moved the gear into place 10 or so steps early. 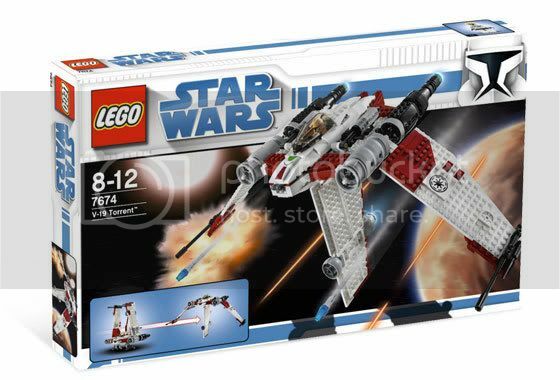 I'd rather like a juniorized version of this ship in a cheaper set because I prefer minifigs to ships but I must admit the whole complex construction worthes the money, especially for those who like TECHNIC and smart ideas to move the wings from resting to flying mode. the earlybird gets the worm, but the second mouse gets the cheese. Yep. Read the previous posts in this thread. I already answered your question. But basically your gears are off. Push the wing & the landing gear to their maximum points without breaking them and then slide the small black gears into place. I got my V-19 today, and its a nice "little"fighter, but also a most annoying build. It took me a few tries to get the landing gear set right. Mine also sits at a slight downward angle, but thats fine by me as its actually easier for the pilot to get in and out. Eh, yep. 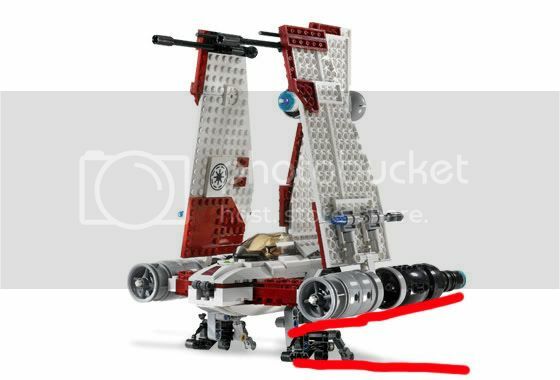 I'm a little disappointed that no1 on Bricklink has shown a modified V-19 from the official set, been coming up dry on how to plug the hole in the rear of the cockpit. Seems like this is a common issue. I think mine is doing the same thing. The center wing is very apt to fall over pulling the two side wings with it when it's picked up. I was impressed with the ship's size. The pix without a minifig for scale belie how big this thing is. Like Gaia, I'm more of a smaller scale builder--all the extras just make the set seem unnecessarily bulky. I would have rather seen click hinges like the Imperial Shuttle with maybe something Technic-wise for the center wing. The sliding cockpit feature is pretty slick and much better than the JSF-pop-the-glass-off type. A nice set, yes, and a lot of big parts for the $, but for me the $55 price tag is not worth it for a one-man fighter. I wouldn't have bought it if not for the fact that I got it for less than half price iw/o the pilot on ebay. I finished building a couple of minutes ago. I like this set, it looks great, has some sweet functions and is very swooshable and sturdy. And I squeezed my finger at the first attempt of letting it fly. I know, I had the same problem. LEGO's never done that before, where you had to remove something you've built, so it completely threw me off. Great set, though. I splurged and bought it yesterday, and I wasn't disapointed. Got this for my son for X-mas. Man am I glad that I wasn't the only one who searched like crazy looking for another yellow beam. Combed through all of our 'extra' lego parts to try to find one, then looked closer at the instructions....Duhhh. especially now that the republic attack shuttle is out..
ship design-wise .. vtorrent outplays the attack shuttle.. I guess you can say that the lack of more minifigs in this set makes this set not worth it. After all, for $5 more, you can get an extra mace windu minifig and a ship that consists of more pieces. But I really like this set, even at it's fairly steep price. 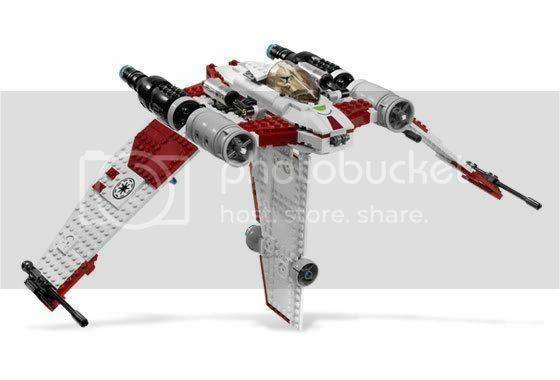 It's my favorite set from the 2008 Clone Wars line, replacing the AT-TE as the set I wanted most this year. After all, you do get that crazy wing/landing gear mechanism. The ship does look nice too, in my perspective. And don't forget about the size of this thing. Correct me if I'm wrong but I believe the wingspan of the V-19 might actually be bigger than that of the republic attack shuttle. Don't get me wrong, the attack shuttle is a nice set too, but I'm diggin the V-19 more at the moment. Would match fairly well with my ARC-170. This set actually seems like it poses a challenge to build, making the enjoyment last longer. Most likely, I'll be ordering this V-19 soon, since amazon has this on sale. Thanks for the good review, now I am convinced to get one! There are actually quite a few positives in this set. The most obvious is the landing gear/wing mechanism that does everything all with the movement of the bottom wing. Some people have had trouble making this work when they built the set, but I got this correct on my first shot because I was being extra careful. This works very wonderfully and smoothly and the V-19 looks great in both landing and flying modes. 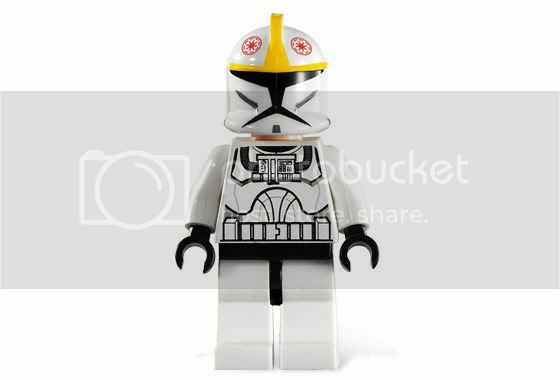 Another good part is the nice clone pilot in this set. The helmet is very detailed, although the republic symbols on it are more oval-shaped than circle-shaped, but it doesn't matter. It's still a very nice minifig. Some complain that there is only 1 minifig in this set, and that's too little for a set that costs $55, but at least the minifig you get is a nice one and not just some normal clone. Another feature I like how the cockpit slides forward. It's simple, but effective. It's my first set with this feature, so maybe that's why it's so interesting to me. The flick fires work, but don't go far at all and aren't very fun to play with anyways. Overall, I think the design of the ship is great and there are some small details on the wings that are created by using certain kinds of plate pieces. Not to mention that this thing is huge! It makes my ARC-170 and old republic gunship look small because it has such a big wingspan. I've heard about the wings falling off easily, but mine has never come off yet. Of course, there is only 1 minifig. I would say another slight negative is that in landing mode, the ship is slanted forward, but I think this is necessary or else the V-19 would tip backwards due to the weight of the 3rd wing. This is not too big of a problem. The biggest problem I had with this set is that it was missing the STICKERS!!! I don't know what happened but my set came without any stickers, so I emailed LEGO to see if they could get me some replacement stickers. So basically, this is a great set, and even though some may find this expensive, I think it's still worth it for that fabulous mechanism. I paid $41.24 for this one off Amazon, but now that I have built the set and realized how nice this is, I think I would have paid $70 for it if I had to. And I'm glad I bought this set over the AT-TE. I think part of the reason why this set is more expensive than normal is the kinds of pieces it contains. It has those two syringe-like pieces that allow the mechanism to work and if you look at the engine, there are tons of big pieces there as well. There are also some pieces in this set that I have never seen before, and it's always nice to have some unique pieces to use. And I agree, it is strange to use that yellow beam on the engine and then take it off again. But it's to make the engine easier to attach to the main part of the ship. The build takes quite a while (1.5 hours for me) and is kinda repetitive, but the end result is worth it. If you have the $55 (i think it's still on sale at Amazon for $41) I would say this is worth it.